Here's a very heart warming story of soldiers heading to Marawi to fight for our freedom. 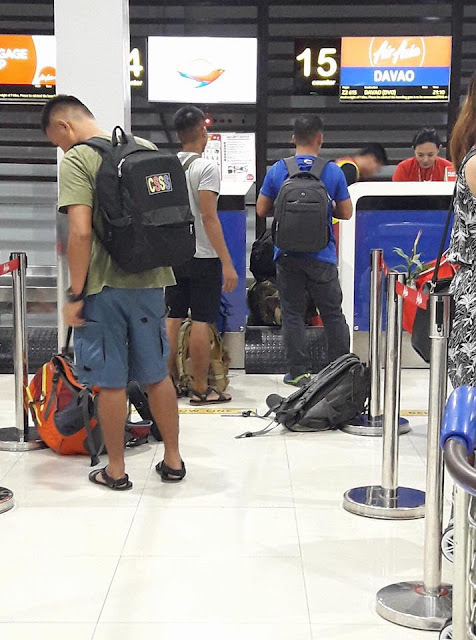 I was on queue for my AirAsia flight bound to Davao tonight (18-7-17) with flight no. Z2615. Ahead of me were 3 humble soldiers. When their turn came to check their luggage in, the lads got an excess with their luggage weight. The staff somehow, did her job efficiently and followed the airline's protocol. So our 3 men without any complaints, stepped back and went to the side and sort their stuff out. But even if how hardly they tried, still there was a 7 kgs. excess in one of the soldiers'. Upon looking at their things, all we can see were their combat uniforms, which got me sooo curious and started to chat with them. 1 passenger suggested to have it cargoed but they cant do it as they have to travel straight to Cotabato and 2 of them are to head to Marawi. After learning where they are bound to, I felt like the need to talk to the Supervisor. I mean, these men are risking their lives for our security, our peace, our freedom... cant they be granted with lil bit of privilege? at least a free 7kgs luggage? Before I went around to try to look for the Supervisor, kind hearted passengers started to offer their extra weight for our soldiers. With that, my heart melted. I was really captivated by the generosity and kindness these passengers shown. It was literally like Filipinos in Bayanihan. And when it was my turn, luckily enough with an extra 2kgs free, the soldier's shoes filled my rucksack in. I am blessed to somehow help them with their luggage, and that was a little thank you for the bigger job they are doing. But, we are even blessed to have these men who are ready to die for our freedom, for our land. Even if they were so called "men in uniform", they remained humble and followed simple airline rules. True heroes not just in war, but as an abiding citizens. Filipino citizens who deserve better at least for an extra few luggage weight.